This 3 day course is designed to expose officers to the concepts and tactics required to make an immediate response to a high risk or catastrophic event. Patrol officers are generally the first responders to most police incidents. This course will train first responders in deployment strategies and real word tactics when there is no time to wait for SWAT. The elements and tactics involved in an active shooter response will be explained and demonstrated. Situations involving warrant service, barricaded gunman and hostage rescue will be discussed. 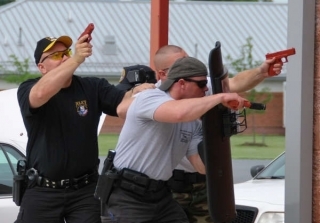 Students will learn the tactical and dynamic use of ballistic shields and breaching devices. Building entry, room entry and room clearing techniques with and without shields will be performed in pairs and in small groups. Proper use of the ballistic shield, shield team movement, victim rescue and returning fire from behind the shield will be taught and practiced. Each students’ judgment, leadership and operational deployment skills will be tested with probable scenarios.